I could have done a 26-post series on the great accomplishments of Hungarian film-making and animation. I could have created profiles for 26 Hungarians that Changed the World. I could have shown you 26 Stunning Landscapes in Hungary. I could have done an entire collection of mouth-watering traditional Hungarian recipes that will kill you in under 25 years. But nooo, I had to go the weird way. Over the month of April, I will present you 26 little stories about weird, ridiculous, or slightly horrifying deaths from our strangle little corner of the world. And the only reason I am not calling this the Medieval Hungarian Darwin Awards is that not all of the victims in the lineup were taken out of the gene pool by their own stupidity... Although some of them probably were. Visit, comment, read, enjoy, and be very glad you live in the 21st century! * UPDATE: I am loving the culture difference in the comments section :) I never even thought this theme would be seen as "gory" or "dark." For us in Hungary, most of the stories I will tell are just a part of the history we learn in middle school. I don't like "torture museums" and the like, so in case you are worried, most of the stories will be interesting, rather than gory. OK, I thought I had gone specific with my theme, but yours sounds really challenging and interesting. Oh, I love the sound of this theme. I've always been morbidly curious about the ways people find to bump themselves off or be bumped off :). Oh dear, I hope I will be tough enough to read this theme. Yours is the first I have read' but ,man I think you got the most original and unusual theme down. Okay, this theme is a little dark and twisted....but I find myself looking forward to it! Now this sounds like an interesting theme. Staying tuned! Everybody likes to read about death as long as it's not their own. I'm sure you'll get plenty of interest with this theme. Oh my word, I cannot describe how excited I am for this theme. Death by group hug? I love it! Your theme sounds so fascinating. I like dark stuff. ;) I'm following your blog now so I won't miss your posts. Wow...that is pretty specific! Sounds interesting. Jean visiting from Rantings and Ravings of an Insane Writer. Epics and Medieval Hungarian ways to die? Epic! Seriously, looking forward to both! This could be interesting and a fun way to learn about Hungary. I am really loving everyone's themes! This sounds so incredibly entertaining. I'm glad you decided to go the weird way! But when can we talk about the food? I admire you that you have 2 blogs in the challenge! This theme does look interesting! Good luck with it! Oh Dear! I'm not sure I'm up to this, but I'll take a look. This sounds right up my street! I'm sure medieval Hungary was as dangerous as most places back then. How ghoulishly wonderful. Fact is so much more chilling than fiction. Wow! I am hooked. I am your newest blog follower and I am delighted I found your blog. This is by far the most fascinating and interesting theme I have come across. Not for the squeamish, no doubt. I am really looking forward to reading your blog post. What an intriguing topic. Sad and graphic, but something I can't wait to see and read about. I will be back in April. You had me from the word "mopdog" and the cute little doggie picture did it. Will be back. MopDog what a creative name. The picture and 'the who is' is really catching the interest. I love the Hulk background! To get to the point - your theme sounds bloodstained and gory in true Medieval style. A time which always have made me curious. I thirst for more knowledge of the dreadful history! Okay well this is definitely one of the most interesting themes I've seen yet. Will be checking back for sure. Great to meet you and Happy AtoZ! This sounds so cool! I'm looking forward to your posts! 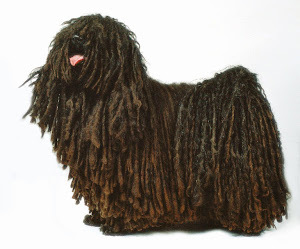 Well, A pulik is closer to a Komondor than it is to a chihuahua, anyway! We have a book called Death in Yellowstone. The whole family, even the kids, 13 and 10, love it. I might be reading your posts aloud! That should be a very cool theme! I love everything Hungary so I'll pass by your blog and get bewildered and probably shocked through April, which isn't a bad idea after all we all need a good shock every now and then. Love the theme, and I'm so impressed you're doing two challenges. I expect to learn and to be entertained by this. A second and fabulous theme. 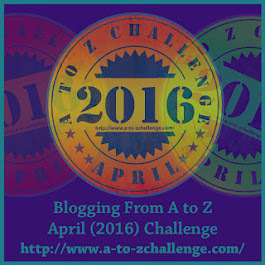 I will be checking in to both your blogs this challenge.